Ramps are only available in the spring and only in certain parts of the United States; if yours is the area, you’ll probably only find them at farmer’s markets or specialty shops. Garlic chives (they look like chives but are flat, with a definite garlic aroma) are typically in abundance in Asian markets; they’re perennial and easy to grow, which is what I do. I love them sautéed or grilled for their sweet, green garlicky flavor. Green onions are easy to find everywhere, every day. Ideas for serving: When I’ve got my grill going, I like to make my almost-Oaxacan-tlayudas: I spread out commercially made tortillas (I buy them from a local tortillería and let them cool off completely) into a single layer, brush both sides of each tortilla lightly but thoroughly with oil, then grill them until they’re crisp. When they cool, I break them into big rustic pieces for dipping. Wedges of grilled pita make a delicious and unexpected vehicle for dipping this guacamole. For a pass-around appetizer, slices of crispy grilled baguette topped with a dollop of bacony guacamole are always a hit. Heat a gas grill to medium or light a charcoal grill and let it burn until the coals are medium hot and covered with gray ash. Lay the halved tomatillos (cut-side down) on a rimmed baking sheet or metal baking pan and slide onto the grill. Brush the ramps (or green onions or garlic chives) with oil. Lay them directly on the grill, along with the chile. Grill the ramps (or their stand-ins) and the chile until soft and richly browned, turning occasionally—the ramps will take 4 or 5 minutes, the chile about 10. Cook the tomatillos about 3 to 4q minutes, until soft and browned on one side, then flip them over and cook the other side. Cool everything. Finely chop the ramps (etc.) and chile, then scrape into a large bowl. Chop the tomatillo into small pieces, scrape them in with the ramps, then scrape in any juice that remains on the baking sheet. While the grilled vegetables are cooling, cook the bacon in a single layer in a large skillet over medium heat, turning every once in a while, until browned and crispy, about 10 minutes. Drain on paper towels, then chop into small pieces. Mash the avocado flesh with the tomatillo mixture: Cut the avocados in half, running a knife around the pit from top to bottom and back up again. Twist the halves in opposite directions to release the pit from one side. Scoop out the pit, then scoop the flesh from each half. With an old-fashioned potato masher, large fork or back of a large spoon, coarsely mash the avocado with the tomatillo mixture. Stir in the lime, cilantro and half of the bacon. Taste and season with salt, usually about 1 teaspoon. Cover with plastic wrap directly on the surface of the guacamole and refrigerate until you’re ready to serve. 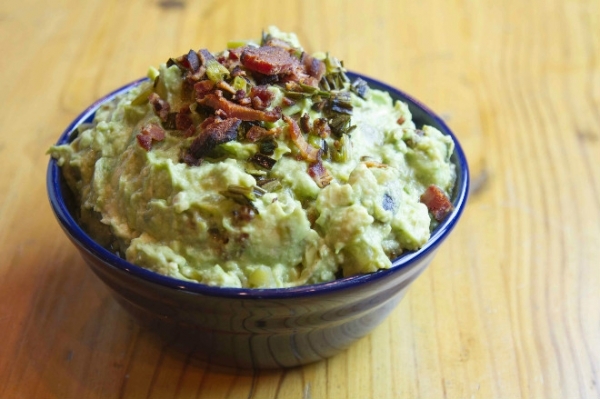 When that time comes, scrape the guacamole into a serving dish and sprinkle with the remaining bacon. Garnish with cilantro leaves, if you wish. 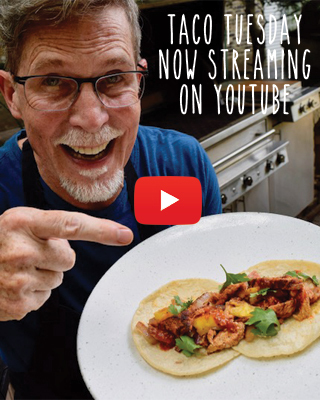 Rick Bayless, Great Show love it a lot . the recipes are fantastic I have tried many and think you are the greatest in Mexican cuisine. Thanks a lot and I will continue to a loyal fan . AWEsome!! we had this at one of Rick’s restaurants in Chicago and it was so good! one of those dishes you could eat till you make yourself sick!